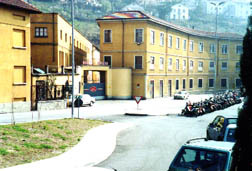 For nearly twenty years I have read accounts in the 'MGNOC News of those lucky riders who have been to the Mecca of our brotherhood: the Moto Guzzi factory in Mandello del Lario on gorgeous Lake Como (Lago di Como, in Italy). Though I dreamed of making the trip myself someday, it never seemed it could become a reality. But dreams do sometimes come true, and I found myself touring the wonderful old factory this past March. At the last minute, however, the dream almost eluded me. My brother-in-law Ken was transferred to Italy to spend a couple of years trying to get his company's Italian factory running more smoothly. He was living near Torino (Turin, as we Americans know it), which is only about sixty miles from Mandello, as the crow flies. He invited his sister Louisa and me to come stay with his family. We promptly accepted. I zipped an email off to Frank Wedge, asking him if he could help me get in touch with the Guzzi factory, to arrange a tour. Frank sent me the email address of Marta Ardesi, who is a charming (and English-speaking!) lady at the factory. She responded that the tour for March would be scheduled for the day after we landed in Italy! All we had to do was show up at the gate at 9:30 on the morning of March 16 and we could see how our beloved machines are assembled. 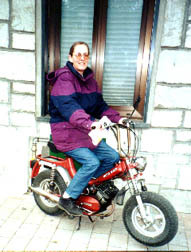 Ken, who is a faithful Harley rider, was interested in joining us, so we set plans to do the approximately two-hour drive to Mandello. He would then leave Louisa and me there. After the tour, we would begin our adventure in Italy, and then find our way back to his place by train. What a great way to begin our visit to the Boot! We flew from Washington, D.C. to Milano (Milan, to Americans), arriving exhausted after a six-hour layover in Heathrow Airport, London. 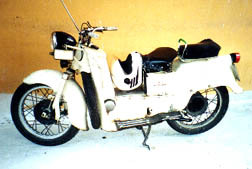 Excited about my visit to the Guzzi factory, I did not sleep well that night. This added to my jet lag drowsiness, and probably helped me goof up the next morning and make us nearly miss our tour. We arose at 5:30 A.M. to allow us plenty of time to drive to Mandello. Ken had not been in Italy very long, so he was not yet really comfortable negotiating those Italian roads, and more important, he had not quite learned to survive the challenge of those Italian drivers. We entered the Autostrada near Torino. If you are traveling any distance in Italy - especially by car - and want to make decent progress, the Autostrada is the way to go. 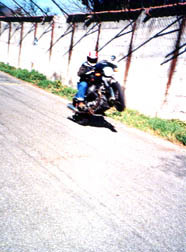 It's either the speedy Autostrada or tiny, narrow roads (great motorcycle roads!) that force you to take five times as long to get where you're going. The Autostrada isn't a lot of fun, however. There is no apparent speed limit, and most of the large European cars seem bent on proving that there is no limit to how fast they can go. Driving this highway takes a much higher level of concentration than Americans are used to investing in their interstate journeys. As Ken focused on the road and our survival, I served as navigator - as I intently examined the unfamiliar Italian map. Although many roads on Italian maps have numbers, precious few actual road signs provide you with these numbers. Instead, the signs give you the names of towns and cities that these roads aim towards. I was further handicapped by my rudimentary Italian...most of the names of towns that I read from the map had about eight syllables and all pretty much sounded the same to me. Then there is the fact that Italy is a very small country, by American standards. The map makes it look much larger than it is, and because the distances are stated in kilometers, this adds to the effect. Finally, Ken was driving so fast that we were eating up kilometers at a much faster rate than I assumed. You might guess that I blew it. We passed our exit. We passed it by a very great number of kilometers. When Ken became convinced that I had taken us too far, he pulled off, consulted the map, and showed me just how far we had gone. It was too many kilometers to backtrack. Instead, we'd make a large sweep north and west, and vector a new course towards Lago eli Como. Not to worry...we still had plenty of time. Good thing that we left so early! But the worrying was far from over. The nice little road we selected from the map looked as though it would wander through the countryside, occasionally going through small towns. In reality, however, it took us through a seemingly endless urban area, which was now nearly gridlocked as people all seemed to want to get to work at the same time. It gave us our first taste of how densely populated Italy is. The road was extremely narrow, winding, and heavily traveled by big, stinky trucks. There was no hope of passing. Very, very slowly, we edged toward Mandello. But the' clock was now moving faster than we were. Not knowing what further surprises might lie ahead, I began to prepare myself for the disappointment of missing the tour. I said nothing to Ken or Louisa, so as not to put a hex on our chances. Thankfully the traffic thinned as we headed farther north. We came into one town - now about 15 kilometers from Mandello and with fifteen minutes to go, we were incredibly frustrated by how Italians lead you through their small towns. Directional road signs sit within the intersection, not before it, so you get no forewarning about which direction you should go. When you get to the intersection, something like six or eight signs greet you, pointing in all different directions (Italian towns are never laid out in rectangular grids), with the town name you want often among the missing. An individual who is unfamiliar with Italian names must slowly read and sound out each name, and wonder which town might be in the direction you want to go. Meanwhile, at least three irate Italian drivers (They have no patience, whatsoever!) have stopped behind you and are blasting you with a chorus of angry horns. As a result, you usually take the wrong turn. We did, and got lost. Once you make a choice at an intersection in a small Italian town - even if it's the correct turn - you have little idea if you've succeeded or not. By then you've lost all sense of direction, because the streets wind like a dish of spaghetti and you are hemmed in by three-story houses sitting right at the edge of the street. These houses completely block your view. It's like being at the bottom of a wavy canyon; you no longer have any idea where the compass directions are. You are doomed to travel to the next significant intersection and try to make sense of the road signs you see there. We were lost! At our next intersection all the signs either listed the names of towns we never heard of and could not find on the map, or towns we had been through and did not care to revisit. We had no recourse but to ask for help. Ken jumped out of the car when he spotted a couple of guys in a road construction crew. I watched in doubt, knowing that his Italian was not much better than mine. The guy nodded and was going on at some length, arms waving and pointing, as he made sure Ken understood his "simple" directions. Ken came back, wanting so badly to believe that he understood. Within two turns, we were lost again. Panic setting in, we stopped again. "Mandello, si." And another exhibition of arm waving would begin. This time I accompanied Ken, and yes, it sounded so simple. We returned to the car, sensing this was our last opportunity. If we didn't escape this town right now, in the correct direction, the tour was dead. Somehow we lucked out. After another two turns we were headed out of town, leaving behind a sign that pointed to Mandello! I gained further confidence when I saw that Lago di Como was on our left as shown on the map. We sped on, knowing we had another seven kilometers to go, and that we should arrive approximately ten minutes late. We prayed that this would be one of those occasions when Italian starting time would be rather casual. We blasted into Mandello. I jumped out at a gas station and shouted "Guzzi" at someone. He pointed to a street; we dashed up it, quickly located the factory, dropped the car in a space, and ran for the doors. We were twelve minutes late, and the place was deserted. The tour had departed. We appealed to the good-natured guard, who had compassion for the looks of anxiety that we wore. He ushered us into his office, called someone on the phone, confiscated our passports, and turned us over to a young dude, who led us to the tour group. Whew! We had the fun of joining a group of about 20 young men (high school kids? ), who had come in a bus. The tour guide greeted us with a welcoming handshake, and we joined the group. The spiel was in Italian, of course, and with the factory noise added to it, we got little from what he said. It was just neat to be there...in the birthing place of my Eldorado. The factory is more modern and efficient than I'd expected. I'd created this image in my head of an Orville-and-Wilbur-Wright-like craft shop, where each part was exactingly carved out of a block of metal, and painstakingly assembled by an Italian artisan. (Well, maybe not quite that antiquated and specialized.) Our tour began in the shop where the many parts in the engine, transmission, and clutch are manufactured and assembled. I was impressed with all the computer-driven grinders, borers, drillers, and milling machines. It was neat to view all the baskets of gleaming gears, rods, bearings, cranks...recognizing them as so similar to what's inside my 1973 Guzzi. I couldn't help but do a quick estimate of the scads of dollars (rather, lire) worth of parts lying in those baskets. There were so many questions that I'd have liked to ask about what I saw. But it was fun just looking and speculating with Ken about how they ran this outfit. Many of the big machines were idle...only about a quarter of them were operating. It did not exactly look like that much of a bustling business. I was pleasantly surprised at how leisurely the tour was, and how they allowed us unsupervised access to all the major machines. One misplaced elbow on the part of one of us visitors, and the production line could go down for a couple of days. Presently we came to the final assembly area. It seemed to be a California day... Cali pieces and parts lay everywhere. I guessed that it makes sense to assemble a bunch of similar models at one time. In this section we did see individual guys putting the bikes into their final forms. The assembly area is huge, with row after row of gas tanks, fenders, handlebars, etc. We watched some guys complete the final machine and then start up the bikes. Exhaust tubes carried fumes outside as they hooked the bike up to diagnostic equipment and did the final tuning. It makes you want to jump aboard one of those beauties and be the first to test it out! And that's exactly what we got to see next, as a test pilot wheeled a Centauro outside to the dynamometer. Our dashing pilot pulled his new machine onto the dyno and proceeded to rev her up. The boys watched m wonder and envy as the Centauro roared mightily. I found myself wondering how a brand new engine takes to being run up to such extreme revs, while under such a load, before all those parts have had much of a chance to get to know each other. 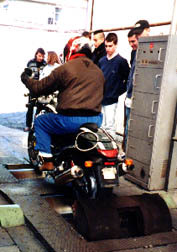 Our test pilot loved showing off for the boys, and after the dyno slowed, he popped the bike off the machine and roared out onto the test track. The track must be less than half a mile long, since it was but a handful of seconds before he reappeared, blasting on by the admiring young men. Ken got out on the track to get a shot of the guy as he passed on his next circuit. The Centauro stopped; the pilot talked with Ken for a moment, then roared off again. Ken shouted to me that he was going to do a wheelie on his next pass, so I also jumped out there to record the event. The dashing dude popped his wheelie, we captured it on film and then returned inside to finish the tour. The test pilot was in his glory as he rode the bike back inside, stepped from his steed, and was surrounded by the wide-eyed boys. He was the exact image of the World War I ace - scarf and all - who had just landed at the aerodrome after yet another successful mission against his brave and glorious adversaries, and was being congratulated by his ground crew, as he made his way to the debriefing room and a cold beer. He had that impressive swagger. As he passed us he stopped Ken and asked if he'd send him a copy of the photo. Our tour was completed in the incredible Guzzi museum. 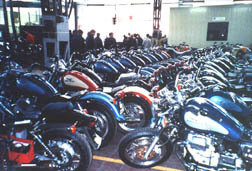 You begin on the first floor, where three venerable machines from Guzzi history repose under glass. Then, when you've had the opportunity to get into the proper respectful mood, you climb the stairs to be greeted by what must be about 200 bikes, all lined up and crammed together in two long rows. It's nearly overwhelming! There must be one sample of nearly every bike that Guzzi has ever assembled, including racers, experimental machines, production bikes...they go on and on. My eyes were beginning to glaze over by the time I'd viewed most of these bikes. It made me wish that I could return every day over the next two weeks and just gaze at maybe ten machines at a time. I believe that even Frank Wedge might get close to saturation while looking at all that Italian metal! We left the factory, glowing in the warmth of the experience and happy for the mad dash that got us there...almost on time, but in the end, successfully so. We headed for a lunch of pizza - I love the small shops that display pieces of pizza and focaccia (a thick pizza-like bread dough, decorated with lots of delightfully tasting goodies). You select a fresh piece, they pop it into an oven, and you chow it down, right then and there. After lunch Ken helped us find a hotel - the "Hotel Giardinetto," right on the shore of Lago di Como. It is a single-star hotel...the cheapest type in Italy. But the price was one that fit our budget. The proprietor of our albergho (hotel, to us Americans) spoke English! In the short time available we had done our best to absorb some Italian language. We did learn enough to struggle through four weeks of travel in Northern Italy without too many disasters. Knowing but a sprinkling of the language of the country into which you are immersed makes one feel very dumb. It is a humbling experience. [When you encounter a native who speaks your language - no matter how little - you become instantly grateful for the blessing. For a few minutes you no longer are forced to feel so dull-witted, but you can actually converse as a normal adult might...ask questions and have a real conversation!] So we had a lovely chat with our albergho owner. He knows David Smith, our MGNOC European Rep...and he spoke highly of him. He explained that it was well before the tourist season, and we would not find much open. That was fine with us. We enjoyed the lack of tourist crowds, which surely must inundate this gorgeous area. Ken headed back home, wearing a look indicated doubt that we would be able to survive this foreign wilderness, let alone be able to negotiate the Italian train system back to his place. That challenge was a few days off, so I wasn't worried. Our next goal was to find a bottle of Italian red vino, some Italian bread and cheese, to begin the first of many samplings of the delightful food available in this country. On the way I made another incredible discovery; the heavenly taste of Italian ice cream. This, I had read, was another Epicurean masterpiece that these people had developed. In Italy it is called gelato. It is served by hand from metal trays that are enticingly displayed in coolers behind glass. The server carefully and sensually spoons the soft gelato into either a cup or cone. Your job is to point out your choice of the varied and wonderful flavors, decide how much you can eat, and then pay for it. Then you are in heaven as you savor this creamy smooth, fantastic stuff. During my visit it was a contest as to whether I ate more gelato or drank more red vino. I pigged out on both. Mandello del Lario is one of many delightful and beautiful towns along the shore of glorious Lago di Como, in the Province of Lecco. Our guidebook reads: "If you are a motorbike fan, the very mention of Mandello del Lario will send tingles down your spine: this is the home of the mythical Moto Guzzi and a visit to the fantastic Historical Museum is a must. Motorbike fans from all over the world come here to pay tribute." We had. In the ensuing days -we saw several Guzzis on the streets...not the touring machines we Americans ride, but those tiny scooters that the vast majority of Italians zip around on. As is the case with most Italian towns, Mandello is steeped in medieval history. Everywhere you see old structures. We never tired of entering the churches and surrounding ourselves in 1000-year-old elegance. The sense of history is mighty impressive to an American, to whom a hundred-year-old building is ancient history. We spent another few days in the Lago di Como area - riding the train up and down the shore, taking a ferry across the lake to delightful towns, and gorging on the views. (And yes, we did figure out how to decipher the train system, and we even got back to Torino - although the trauma of surviving the big-city train stations sorely tested us). On our last morning, we were in one of the ubiquitous Italian bars for breakfast. These establishments may be true bars (as we Americans know them) in the evening, serving alcoholic beverages, but in the morning they mainly offer espresso, cappuccino, and sweet rolls. This is about the only breakfast one can get in Italy. You watch folks stroll in, order an espresso, receive this tiny cup that has maybe one tablespoon of potent black caffeine, toss it quickly down, and move on. However we would usually take our time watching the action. A Guzzi freak owned this particular bar, as the walls were decorated with many photos, posters, and other Guzzi paraphernalia. I sat watching the customers come and go, observing the few old men, sipping their espresso (often laced with a fortified wine called grappa), as they simultaneously and loudly talked at one another, waving their arms to punctuate their speeches. The smoke from smelly black cigars wafted through the room. When we got ready to depart, I pulled out a copy of the Guzzi News that I had carried along, and I showed it to the proprietor. I stuttered through some pidgin Italian, trying to tell him I was from America, and had come to Mecca to visit the Guzzi factory. He didn't act very interested in what I was showing him, and I felt a little disappointed. He motioned for me to wait, as he disappeared into the back room. In a moment he returned and handed me a gift. It was a medallion from 1981, on the occasion of Moto Guzzi's 60th anniversary. It had been issued as a commemoration medal at a rally held then. On its back side a tiny map shows Lago di Como and the date of the rally. The face of the medallion shows the proud Guzzi eagle, and the inscription, in Italian: "Da 60 anni un fatto italiano che il mondo invidia." My best translation attempt: "For 60 years an Italian creation that the world envies."